A volunteer “college coach” with College Summit, Kevin Hudson, left, tells students that college admissions officers won’t be impressed with their dreams if they have no proof of them doing anything to make them come true. The words that came out of the high school senior’s mouth initially sounded good. He spoke of aspiring to attend MIT and majoring in astrophysics and aeronautical engineering. But the student’s high school transcript told a different story. He had a D in Algebra II and hadn’t taken any classes — neither physics nor precalculus — that would suggest he was serious about going to one of most competitive universities in the nation to learn how to design and fix things that fly. The student explained that he doesn’t do his schoolwork because he doesn’t find school challenging and tends to “blend in” with the other slackers. Asked if he had done anything outside of school to demonstrate a genuine interest in astrophysics and aeronautical engineering, he had no examples to offer, despite living in a city where such programs are abundant. Kevin Hudson, the veteran college adviser to whom the student was speaking, told him that college admissions officers won’t be impressed with his dreams if he had no proof of doing anything to make them come true. “Admissions officers see a lot of stuff about aspirations and visions,” Hudson told the student as they sat at a table underneath the shade of a metallic umbrella on the terrace of a building at UMBC. And if college admissions officers don’t see evidence of a student’s aspirations, Hudson said, they won’t be convinced that those aspirations are serious. So Hudson advised the student to take physics and calculus this coming school year and to get involved in some type of program that deals with the subjects he says he wants to study in college. “You want that story to stand up,” Hudson told the student. 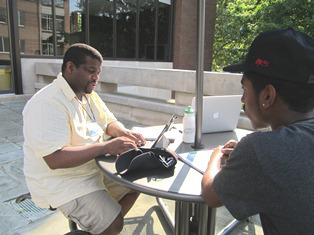 Hudson’s candid advice came this summer in his capacity as a volunteer “college coach” with College Summit, a national nonprofit that seeks to connect students from families of lesser economic means to the world of college and careers. It took place during one of 31 college workshops that the organization offered for free to nearly 2,000 rising seniors throughout the nation. Among other things, students get help with starting their college admission essays, creating a list of prospective colleges both above and below their academic qualifications, and making a list of “action steps” to take during their senior year in high school. Program officials say the workshops fill a crucial void for students from schools that often fail to provide students with the guidance they need to make one of the most critical decisions of their lives: where to attend college? “You ask [the students], When did you see your counselor? Sometimes never. That happens,” said Kevin Naiker, director of college coaching at College Summit and a professor of psychology at Community College of Baltimore County. “Most of the time, they self-advise,” Naiker said. Experts give College Summit high marks for its work with low-income and first-generation college students who might otherwise have a tough time going through the college admissions process. “The experience of college officials and ample research show how challenging college is for first-time college goers,” said Andy Rotherham, co-founder and partner at Bellwether Education Partners, a national nonprofit that has collaborated with College Summit to produce a paper about the need to better educate students how to navigate the college search and application process. Awilda Rodriguez, assistant professor at the Center for the Study of Higher and Postsecondary Education at the University of Michigan, said more must be done to make the service that College Summit provides a more common feature of the nation’s high schools. “The idea should really be how do we get what College Summit and other organizations deliver into the high schools, so that students have access to the information they need early on and in a consistent fashion,” Rodriguez said. College Summit offers three varying levels of programming in high schools throughout the nation that subscribe to its service. Wanda Davis, a College Summit instructor at Normandy High School in St. Louis, Missouri, found through research for her dissertation that College Summit was more effective with at-risk African-American high school students when it was offered as a graded class as opposed to a “pass/fail” model. “Most students are used to the traditional grading system; therefore, knowing they are competing with their peers encourages them to work harder through the rigorous coursework,” her dissertation states. Competition could be crucial for students such as the one that Hudson was advising. “If I go somewhere where it’s a bunch of people and everyone is slacking off, I’m gonna slack off, too,” the student said. But Hudson advised the student — who was being trained by College Summit to become a “peer leader” in the College Summit program at his school — to shun lackadaisical habits. “It’s one of those things where you need to acknowledge what it is so you own it and then you fix it,” Hudson said. “But what happens is a lot of people, they don’t acknowledge what the issues are, then just keep repeating it over and over again.